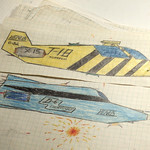 I used to draw spaceships when I was in the 5th grade, and I kept at it until freshman year in college. I still have all my drawings, and it's fun to look at them. Starting in the 5th grade, a number of us started the space arms race. The general rule was that if you drew it, you had it in your armada. We chose names for our galactic empires, formed alliances, and schemed. Though most people stopped by the time they hit the 9th grade, I kept drawing them occasionally through freshman year of college. Influences: Stewart Cowley's series of "Terran Trade Authority" books, Battlestar Galactica, Buck Rogers in the 25th Century, Star Cruiser Yamato (Star Blazers here in the US), Macross (RoboTech here in the US), and a few military aircraft and tank books. Strangely, there is not a lot of Star Wars influence, probably because I couldn't get access to the books and movies until I was older. Here's a link to a blog post I wrote about these. There a few different scans. You Drew it, You Flew It!